As you may have seen, over the past couple of weeks, Worldbuilding has been building not a world, but a blog. The setup of that blog is now complete! You can come and visit us now. But we're by no means done! If you missed out on getting involved, or have changed your mind and want to, that's fine - you're welcome to get involved with writing now. We'd love to see posts from lots of people here - series of posts on a topic, or just single, one-off posts. It's up to you what and when you write - don't be shy! If you want to get involved, just drop into this chatroom and ask someone to add you - if they can't themselves, it's likely they'll know of someone who can. You'll need to create an account on Medium, and leave the username of that account in your message. We've got a blog - follow along! We want to make it easy for people to contribute to the blog, whether there's one article that you want to write or you have an idea for a whole series or you're just not sure and want to check us out. This post is for you. If you have an idea already, please either comment here or tell us about it in the blog chat room. If you want to write but don't know what to write about, you can look through past suggestions from people here on meta. See anything that's been requested that you can do? Let us know! You can also browse all the past posts on the blog for inspiration or come talk to folks in the chat room -- people there are happy to kibbitz on ideas. We also have this older post where people who are interested can sign up. If you edit that post to add yourself, somebody will follow up with you. You do not need to wait to be asked. Once or twice we've invited people to contribute something -- for example, turning an answer here on Worldbuilding into a post on the blog. But this is meant to be an open project. We'd love to see more people and a broad range of worldbuilding-related topics. When you're ready to write, here's how to use the tools on Medium. What is the blog process? How does stuff get there? Great, you want to write, you maybe have a specific idea, you've made yourself known, maybe you've started to write your first post for Medium -- now what? How does the team operate? Blog coordination happens mainly in the blog chat room. When you're ready to start a post, let us know what you're doing and it'll go into the buffer. If we don't hear from you with an update after a while we'll check in with you, but there's no pressure. The better idea you can give us of what you're doing and when it might be ready, the better job we can do of scheduling it -- but we're a pretty flexible bunch, so don't worry if you're more of an "I'll tell you about it when it's done" person. A mix of topics. Worldbuilding is big, from hard science to magic systems, from technical articles to how-to posts about writing or game-mastering to fiction, and more. A mix of article types. Some articles are discourses on specific topics, such as what you need to know about black holes. Some are more how-to in flavor, such as a process to help make believable magic systems. And some are anecdotal, e.g. I wanted to design a species with three genders, here's what I did, and here's how it worked out. A mix of articles and "community" posts. In addition to being a blog about worldbuilding, this is the blog of the Worldbuilding community. We include interviews with community members, discussions of questions/tags/challenge topics, and potentially other stuff about the community. A mix of authors. We'll almost always give priority to a new or infrequent poster. Have questions? Comment here or ask in the chat room. We look forward to working with you. Each time a new contributor has been brought on board, we've had to get them up to speed on the tools we're using - specifically, we've had to explain how to use Medium. This is through no fault of the fine folks who write for the blog, so we'd like to smoothen the onboarding process by providing this guide on how to get started writing for us on Medium. Signing up for Medium is pretty easy. Go to the Medium homepage and click "Sign In / Sign Up" in the top-right corner. You can sign up using your Google, Facebook, or Twitter identity (like on SE), or you can create an account using your email address. Note that at no point you are asked for a password, even if you use your email to sign in. Don't worry about this; this is by design: Medium does not use passwords, but relies on the security of the linked account(s). If you want to log in through email, you are sent by email a new login link that's valid only for a limited time. If you don't want to go through this process every time and don't have/want to use an account on Google, Facebook or Twitter, you should allow Medium to set persistent cookies (that's the browser's default, so if you have no idea what I'm talking about, you'll probably not have to do anything anyway). That way you'll remain logged in even after closing the browser. Before you can submit anything to Universe Factory, you've got to write it. Hopefully you've been to the chatroom by now - drop a note in there that you're starting writing, and someone'll add your article to the "Pending" list so that we can look at potential spots. See that little circular icon in the top-right corner (your avatar, if you've set one - that default image shown above, if not)? See that button to the left of it that says "Write a story"? Click that. 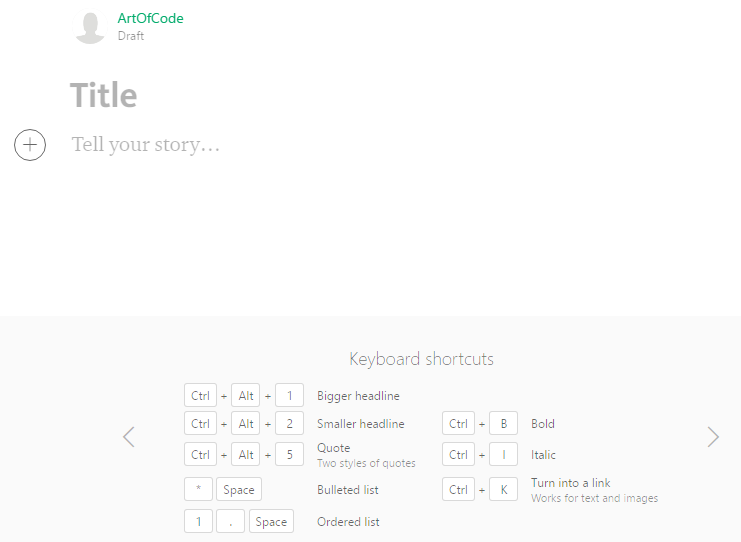 Those keyboard shortcuts at the bottom should help you with editing; Medium does also have some on-site help with their editing tools. They're not the best, but they work. 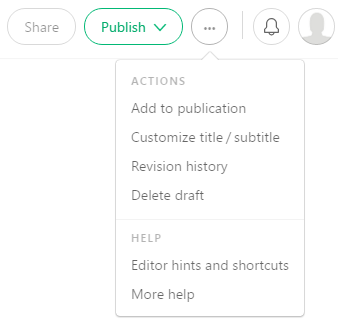 Choose "Import story", enter the URL where you've posted your work, and you'll get a draft in the Medium editor. You can make further edits here. Most (if not all) of the posts you see on Universe Factory's homepage have a background image, or "cover" image. This is a feature of Medium: if you have an image in your post, it uses that image as the background image. There are benefits to doing this: a plain-white background story looks a little out of place on an image-full homepage, and posts without a cover image don't occupy the "latest post" slot. We recommend including an image to use as a cover, but it's not essential. If you want some help picking a cover image, drop into the chatroom. When you've finished writing your article, you can submit it to Universe Factory for review. At least, that's what Medium calls it - in reality, we use that "review" period more like a queue. If you'd like us to check it through for mistakes and coherency, we can - just drop a note in the chat room asking us to do it. We usually don't correct anything but the most glaring errors, unless you ask for it. Click "Add to publication". You should now get a menu detailing the publications you can submit to; select Universe Factory and click "Submit draft for review". Your part is done now; all that's left is to publish. The editors have a queue of submitted drafts; every 3 days (at least, that's what we're aiming for) we'll publish something for it. You can drop into chat to check out the progress of that and to shout if there's something you want to input to the process. We're a friendly bunch! 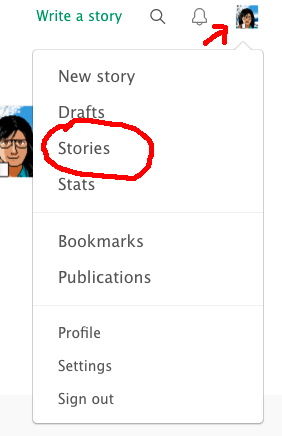 Go to the list of submissions ("stories" on the blog menu) and click on the one you want to publish. Click "edit" at the top. Read through the post, fixing any typos or formatting problems you see. We take a light hand with edits, but typos and grammar-os happen to everybody sometimes. Don't impose your voice on the author, of course, like Americanizing British spellings. Click "publish" at the top. Look at the tags and make any adjustments that seem appropriate. Click the button to publish. The page should refresh with the Universe Factory header (and the URL should be rewritten). Go to the blog front page (you might need to force a refresh; blame caching) and make sure it looks ok (text is visible on the background graphic, etc). Go back to the post so you'll have the title, author, and URL handy. Go to the blog announcement. On the question, start an edit, grab the markdown for the newest post (title + link, and author), and then cancel the edit. Edit the answer to add the post you just grabbed. New posts go at the top. The month headings are the month it was posted, which might not be the current month if you're doing this early in the month. Remove the older post ("previous post") and label the current one (the one you just added to the answer) as the previous post. Add the newest post, following the format. Pick out something from the post to entice people to read it -- usually the first paragraph or two, but sometimes something a little farther down works better. Or if it doesn't lend itself well to that, write a teaser. If this is a new contributor's first post, highlight that. Update the title of the question to reflect the newest and now-previous posts. Check the list of upcoming posts at the bottom; if this newest one was on that list, remove it. This part requires a Worldbuilding moderator. In the mod tools, go to "community events". Assuming there is a live event for the previous blog post, edit it. Replace the URL with the URL for the answer: https://worldbuilding.meta.stackexchange.com/a/4038. Save the change. On the same page, create a new event, called "New blog post: (title)". For the URL, use the question URL. Set the start date to approximately now and the end date for about a week later. (Also set the number of preview days to 0.) Save the change. Not the answer you're looking for? Browse other questions tagged discussion faq blog . What worlds are you currently building? Can we have an SE blog for this site? Should we have some Guidelines to Creating Magical Creatures? Do we (still) want a site Twitter account?